How severe a problem is what many call the 'democratic deficit' of the European Union? Despite a voluminous theoretical literature dealing with this question, there is hardly any systematic empirical investigation of the effectiveness of the system of political representation in the EU and of the legitimacy beliefs of EU citizens that spring from it. This volume elaborates a conceptual framework for the empirical analysis of the alleged democratic deficit. 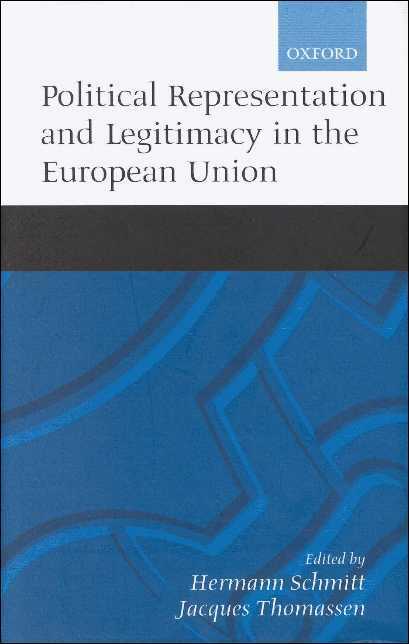 Four dimensions of legitimacy beliefs are identified and analysed: the European political community, the scope of EU government, the institutions and processes of EU government, and EU policies. Turning to the dual mechanism of political representation in the European Union, the Responsible Party Model is utilised to develop criteria for the assessment of the functioning of representative democracy. It requires that competitive and cohesive parties exist; that voters have policy preferences and perceive the policy options on offer correctly; and that voters base their electoral choice on these preferences. Were these conditions met, the process of political representation would result in a close match between the preferences of the voters and the policies of the elites. Large scale representative surveys among the mass publics and different strata of the political elite of the EU and its member-states are analysed to answer these questions. The results demonstrate, by and large, that legitimacy beliefs of EU citizens are the more positive the less specific the object of identification and evaluations is; and that the process of political representation works pretty well as long as other than European Union issues are concerned. These findings are finally discussed in view of familiar strategies for institutional reform of the European Union. LIEVEN DE WINTER, Professor at the Catholic University of Louvain and at the Catholic University of Brussels, Belgium. MARK N. FRANKLIN, Reitemeyer Professor of Political Science, Trinity College, Hartford, Connecticut, USA. SÖREN HOLMBERG, Professor of Political Science, Faculty of Social Sciences, Göteborg University, Sweden. MICHAEL MARSH, Senior Lecturer, and Head of Department of Political Science, Trinity College, Ireland. PIPPA NORRIS, Associate Director of the Joan Shorenstein Center on the Press, Politics and Public Policy and Lecturer at the Kennedy School of Government, Harvard University, USA. ANGELIKA SCHEUER, TMR Research Scholar, Faculty of Social and Behavioural Sciences, University of Amsterdam, The Netherlands. HERMANN SCHMITT, Senior Research Fellow at the Mannheimer Zentrum für Europäische Sozialforschung, University of Mannheim, Germany. MARC SWYNGEDOUW, Professor of Political Science and Sociology, Catholic University of Leuven and Brussels, Belgium. JACQUES THOMASSEN, Professor of Political Science, Faculty of Public Administration and Public Policy, University of Twente, The Netherlands. VAN DER BRUG, WOUTER, Assistant Professor, Faculty of Social and Behavioural Sciences, University of Amsterdam, The Netherlands. VAN DER EIJK, CEES, Professor of Political Science, Faculty of Social and Behavioural Sciences, University of Amsterdam, The Netherlands. BERNHARD WESSELS, Senior Fellow at the Wissenschaftszentrum Berlin für Sozialforschung (WZB), Germany.